It was on April 27, 1983 at Sharp Hospital in San Diego where I was born. I grew up in a suburb of San Diego, named Rancho de los Peñasquitos, and attended Pre-School at Christian Care Pre-School in Mira Mesa. After finishing Pre-School, I went to Sundance Elementary School in 1988 as a Kindergartner. I made a lot of friends in Kindergarten and 1st grade, but I lost a bunch of my friends in second grade when a new school opened up and many of them went there. While I was in the 2nd grade, I got enrolled in the Cub Scouts. I was part of Boy Scout Troop 667. But I was forced to quit because of school and other activities that were taking up my time. After 6 years in Elementary School, I graduated from the fifth grade in 1994. 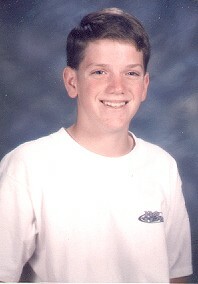 In the fall of '94, I went to Mesa Verde Middle School as a Sixth grader. I got to see a lot of my old friends for the first time since the 1st grade. As well as seeing my old friends, I got to meet some new friends. I have just recently graduated Middle School, and I have started a whole new year as a freshman at Mt. Carmel High School. I'm also proud to be playing the trumpet in the Mt. Carmel Marching Sundevils. I play the best instrument in the the best marching band, it can't get much better than that. The Marching Sundevils are nationally recognized, and have been a part of many prestigious events. Some of which include the Tournament of Roses Parade, and a Snapple commercial. Everywhere they compete, they are awarded many awards, and they have won the sweepstakes award at the Arcadia Band Review an unprecedented 9 times. Please enjoy your visit, and feel free to look around my page. If you'd like to chat with me, just message me on ICQ at 1955285, or if you have AOL or AOL Instant Messenger, my screen name is creanium. Please enjoy your visit, and feel free to look around my page some more.